There are two ways to remove or repair a diseased organ of your abdomen. One way is conventional open surgery with a big scar on your tummy whose length could be from 2 to 9 inches. The other option is laparoscopic surgery where the same operation is performed with 3-4 minitature incisions- each 3-12 mm long. 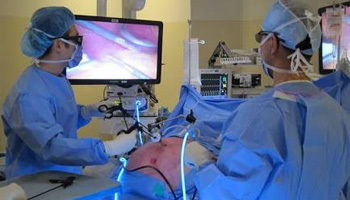 Benefits of Laparoscopic surgery are significant: almost bloodless operation, less chance of infection at incision site, painless and quicker recovery, shorter hospital stay, faster return to work, no ugly scars on body, minimal chances of developing hernia etc. Our center was the second in India in 1991 to offer laparoscopic surgery. Since then we have come a long way to become one of the most experienced centers in India for Laparoscopic surgery with the highest number and most complex surgeries performed under laparoscope.